The only rehydration solution with PreActivTM prebiotics and zinc. Rehydrate with Pedialyte® to feel better fast. 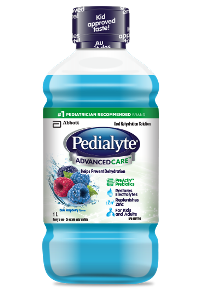 Pedialyte® is the #1 recommended brand by pediatricians for preventing dehydration due to vomiting and diarrhea in both children and adults. Pedialyte® contains the optimal balance of sugar and electrolytes for fast rehydration. Pedialyte® helps with more than just the stomach flu. Food poisoning, a couple of cocktails, heat, travel, and exercise can all lead to dehydration too. to feel better – fast.